The College of Studies (shedra) introduces some of the key philosophical works of the Kagyu tradition. Studying these works extends and deepens our understanding of the Buddhist teachings and informs our meditation practice by developing our insight into the nature of mind. Each year the shedra consists of three weekends of teachings given by Lama Jampa Thaye. These teachings are open to anyone with a serious interest in Buddhism. The shedra is named in honour of Mikyo Dorje, the 8th Karmapa (1507-54), a master of great scholarly and meditative accomplishment and composer of numerous authoritative works. The curriculum of studies at the shedra consists of works composed by Indian and Tibetan masters, including Asanga, Nagarjuna, Gampopa, the 3rd Karmapa Rangjung Dorje, and the 8th Karmapa Mikyo Dorje. It is essential to keep a record of Buddhist teachings we have received so that we know what we are able to study and practise. See the record of teachings given by Lama Jampa Thaye, including initiations and reading transmissions. Lama Jampa will continue teaching this major text. The Jewel Ornament of Liberation, by Gampopa, is the key manual of study and practice in the Kagyu tradition. It gives a complete explanation of the Buddhist path from its starting point to the achievement of enlightenment, and is relevant to anyone with a serious interest in Buddhism. Among the topics covered are impermanence, karma, suffering, loving kindness, compassion and the six perfections. Gampopa (1074 -1153CE) was the principal student of the great yogin Milarepa, and is one of the most highly revered Tibetan Buddhist masters. The teaching will be held on Saturday from 10.30am to 4.30pm and on Sunday from 10.30am to 1pm. 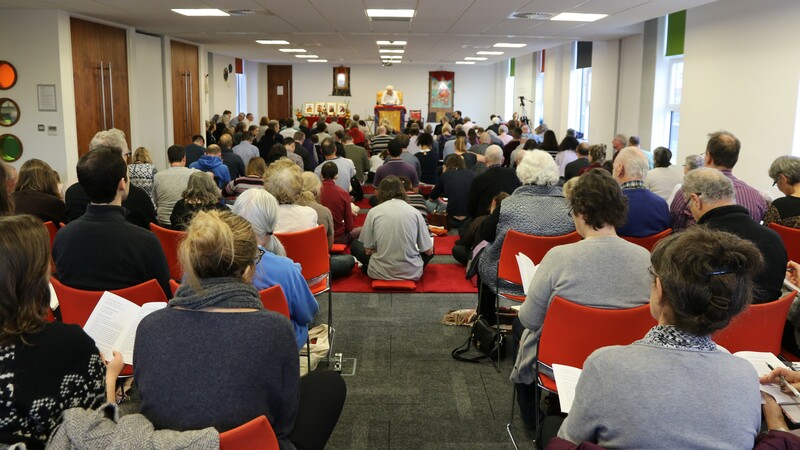 On Sunday afternoon from 2.30pm to 4.30pm Lama Jampa will give the initiation of Amitabha. While anyone with a serious interest in Buddhism is welcome to attend the teaching, the initiation is open only to those who have taken refuge, i.e. made a formal commitment to Buddhism. Venue: The Studio Lever Street, Manchester M1 1FN.